Understanding and troubleshooting quilting issues will help make your quilt a success. You're in for a real treat with the digital edition of Quilter's World! Quilter's World magazine is absolutely bursting with new, exciting patterns and techniques that are chosen with you in mind! You're guaranteed to find plenty of patterns to stir your imagination and keep your creative juices flowing. You'll enjoy a variety of styles and designs for quilts and bargello designs! Quilter's World magazine includes them all! Subscribe to the digital version of Quilter's World magazine and see for yourself what the fun is all about! Quilter's World fits into your busy lifestyle with great-looking projects for every occasion and for everyone in your life! But don't take my word for it, read what subscribers are saying about Quilter's World magazine. Quilter's World magazine is my favorite quilting magazine. The projects are easy to follow and I like the illustrations. Love it. Read it cover to cover when received. Really like the Favorite Finds pages so you not only receive wonderful patterns but updates on the newest notions and ideas to make our quilting life easier. the next three issues -- one every quarter as they come out! two years of past issues -- including instant access to 125+ patterns, all easily searchable! With Quilter's World digital, you get immediate and free delivery of each issue, the ability to save and reference your issues anytime and anywhere (online and offline), and a paperless reading experience with high-resolution quality! 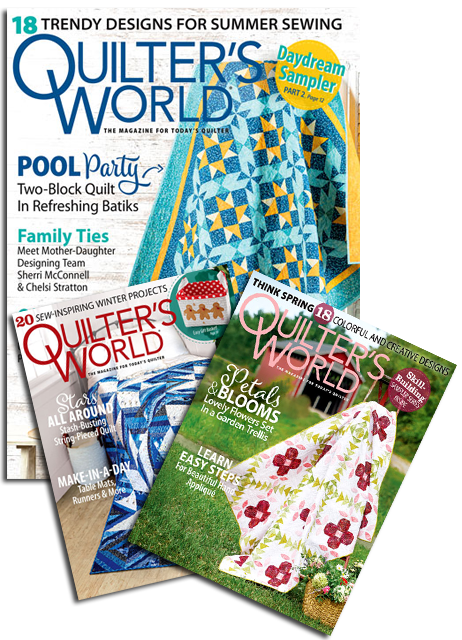 A digital subscription to Quilter's World magazine is $19.97 a year (that's 29% off the cover price! ), and you'll get the current issue plus two years of back issue access immediately. Plus you'll get the next three issues as they come out. 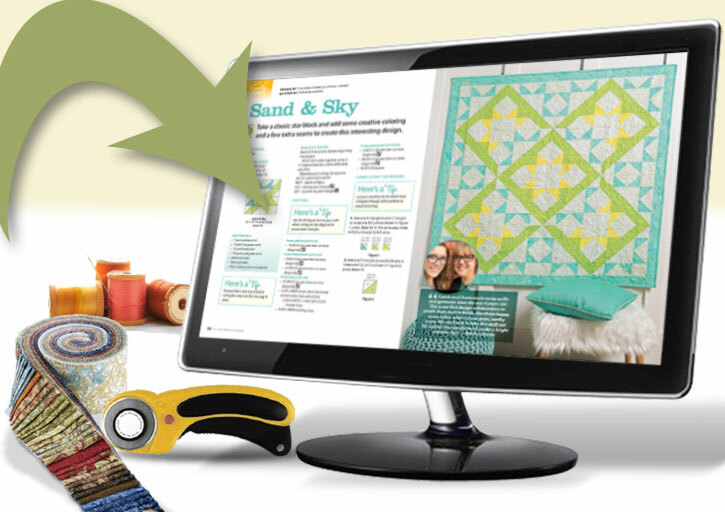 That's 3 years of quilting patterns and articles with your 1-year digital subscription! By clicking the "Continue" button below, I understand you will charge my credit card or payment method for the amount above for my digital subscription. Then, unless I tell you otherwise, I will receive uninterrupted service and access to the digital magazine, and my subscription will be automatically renewed near the end of each subscription term, at the rates then in effect. I authorize Annie's (Quilter's World magazine) to fulfill my digital subscription and charge my credit card or payment method for the current subscription and all future renewals. If my credit card or payment method is declined for a future renewal, you will mail me an invoice at that time. Refunds for a cancelled subscription will be applied to my credit card or payment method. All orders are subject to approval by my credit card or payment method company, and I am under no obligation to purchase future renewals. If I am not completely satisfied, I can cancel at any time by visiting customer service.